I had so much fun grilling this so I thought that's reason enough to share the recipe. My mom had this bunch of chicken legs marinated and pre-cooked meant for frying to serve to my friends at last Saturday's lunch. 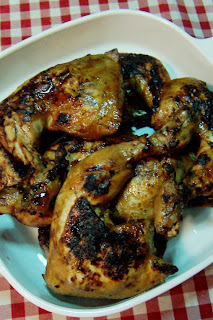 But in the spirit of "happy cooking", I decided to barbecue the chicken over coconut husks and charcoal. As we do not have barbecue sauce in the pantry, I made some myself (why not, right?). We had, after all, sweet and sour sauce, soy sauce, and other condiments in the shelf just waiting to be picked up. I tried my best to recreate the measurements of the ingredients in the recipe below. But feel free to adjust the amounts according to your taste. Inihaw is the Filipino-Tagalog term for "grilled" and this normally means grilling food over fire and dry wood as opposed to gas powered grills. We have several coconut trees growing in our backyard so coconut wood is the natural choice for our own grill. Coconut husks are particularly notorious for creating enormous amounts of smoke when thrown into the fire. But this usually goes away after the husk gets charred. The husks, however generate occasional spit-fires in the course of their combustion. This may cause mild charring to your food but can likewise easily turn your food into charcoal if you are not careful. In a bowl, season chicken with crushed garlic, kalamansi juice, salt, pepper, and paprika. Make sure the seasonings are evenly distributed in the chicken. Put seasoned chicken pieces in a casserole and add water up to half an inch above the chicken pieces. Bring to a boil. Add soy sauce and simmer for thirty minutes. Remove the chicken pieces from the casserole and let it cool down to room temperature. In the meantime, prepare the basting sauce. In a small bowl, combine all the ingredients of the basting sauce. Whisk together until the sugar is dissolved. Prepare the grill. (We use a combination of coal and coconut husks or coconut wood, to ensure occasional little spit fires in the grill.) If the flame gets too strong, be ready to spray it with water just enough to tame it but not kill it completely. Drizzle a small amount of olive oil all over the chicken pieces to prevent sticking. Grill one side of the chicken over medium hot flame for five minutes. Turn the chicken over and with a barbecue sauce brush, baste the grilled side with sauce. After five minutes, turn the chicken over again, basted side down, and baste the other side. Grill each basted side of the chicken for another three minutes. The basting sauce has sugar in it so be extra extra vigilant in making sure the chicken does not get too charred. Note: I know it may not be very healthy but I think the charring is part of the appeal of this dish. Of course the charring is optional. Just be very quick with the flipping until the desired brownness is achieved. The chicken is already cooked after all so you do not have to to worry about it being undercooked.